Great investors are made in volatile markets. Nifty is down ~7% from peak while Small Cap Index and Mid Cap Index have fared worse and are down a lot more. More than the market action, the doomsayers are out in full force on media. The recent events – rating downgrades, Rupee fall, credit markets volatility etc – have spooked the markets. Imaginations are out in full force on the worst that can happen. First, don’t do anything in a rush. Don’t second guess your investment plan. Don’t do something just to seem more action-oriented. If you are itching badly to do something, buy Rs 100 of IDFC Nifty fund and call it a day. As in life, so in investing – make decisions in a calm state of mind. Second, realize that such corrections happen in the market quite often. Anyone who has lived through the tech bust of 2001 or the global financial crisis of 2008 will tell you such corrections are quite common. 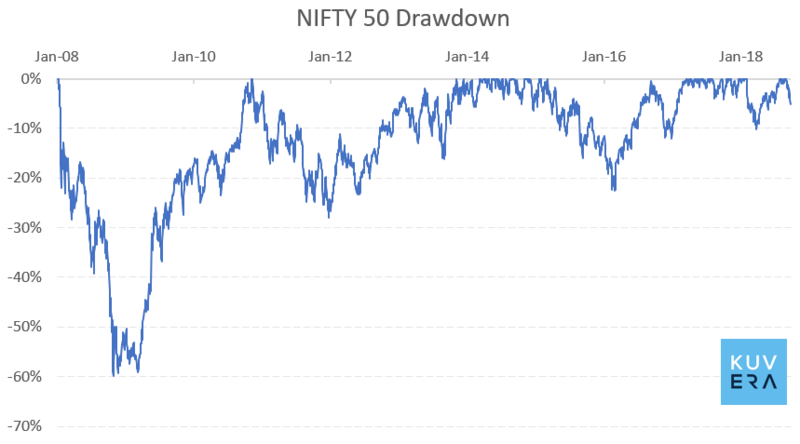 Just to make the point, below is the drawdown chart for NIFTY since 2008. It plots how much below the all-time peak Nifty was at that time. NIFTY 50 was 7% or more below its all-time peak 58.1% of all trading days since Jan-2008. So, drawdowns are common. Markets don’t go up in a straight line. Third, media and financial journalists cannot predict future returns. They amplify what is happening – good or bad – and make it newsworthy. Neither can bloggers, research analysts, wealth managers or even fund managers. So don’t get overwhelmed by the noise. Finally, stick to your plan. Keep it simple. If your plan was to buy on dips, do that. If it wasn’t, don’t. Don’t buy on dips just because your friends are. So, what differentiates a great investor from the rest? They stick to the plan even after being punched in the face. Top 4 reason’s the young and the restless don’t invest! Yes it is right and very realistic.I continuing my investment in this market. sip must be continue in down market otherwise its basic purpose will go in vain. Yes everyone should have long term view of at least 10 years . Once your investments grows 12 to 15 % CAGR over 10 years , such corrections wont affect your returns over long term . Correction are very much needed to correct value of overbought equity and you can get bluechips in fair price . Those who will wait in volatile markets will get good return in 5 to 7 years . You can book partial profits when market is at peak and invest in low risk funds . I am a bignner in mutual funds. But Kuvera is so far so good for me. Many thanks Nitin for your kind words. I am new to this app and website and also a rookie in mutual funds. But kuvera makes it quite simple and easy to understand. Good work. What funds should I buy at this point in time? Thanks Gaurav bro for making it clear…. Can u tell me kuvera unit is demat mode ?? Schemes bought on Kuvera are in non-demat mode. We do no support HUF accounts yet. We will announce once we start supporting them.